Presenting the retinue of Duc le Mulvard, fresh from skirmishes against the orcs of the Grey Mountains. 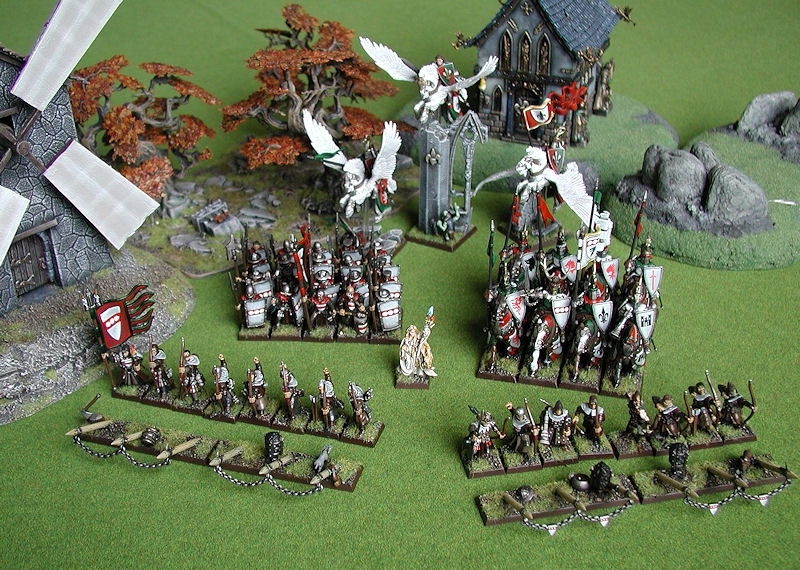 The colour scheme is very unified across the whole army, and is actually based on my family crest and colours; red, white and green (see below). This gave them a very dark and grim look, as there are no colourful flags and trappings. Continuing the family theme, Euan is actually the champion of the Knights, Yukiko is the Damsel (although she wanted pink! ), and I'm playing the long-haired champion of the Pegasus Knights. Mash is there too, if you look! 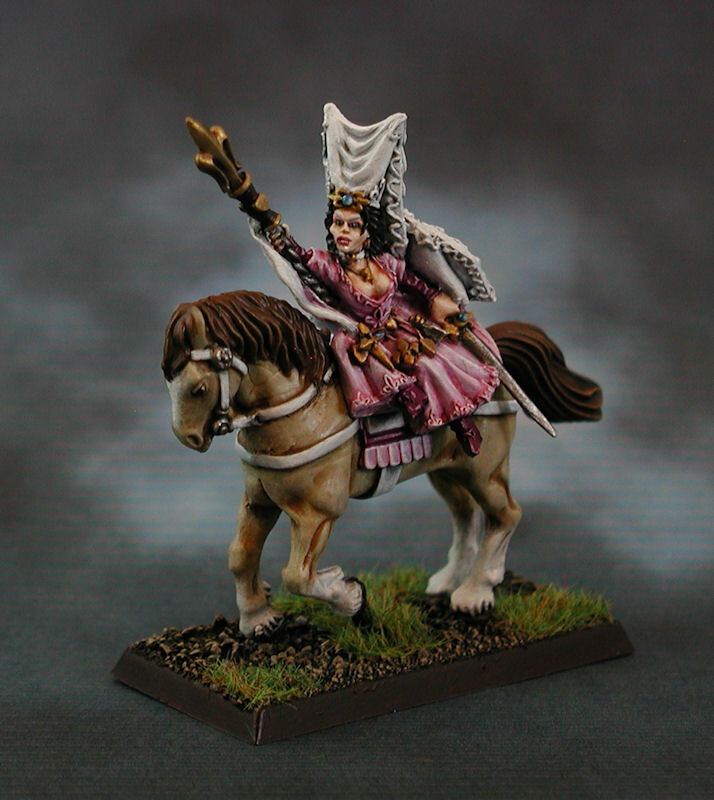 Damsel le Mulvard, ward of the Duke, occasionally leads the retinue into battle. UPDATE: How's this for spooky?! Abe-san presented me a while back with this Green Knight model he'd had for years, and I've been saving the painting of it for a special occasion. Hopefully he'll love it when he gets it back? 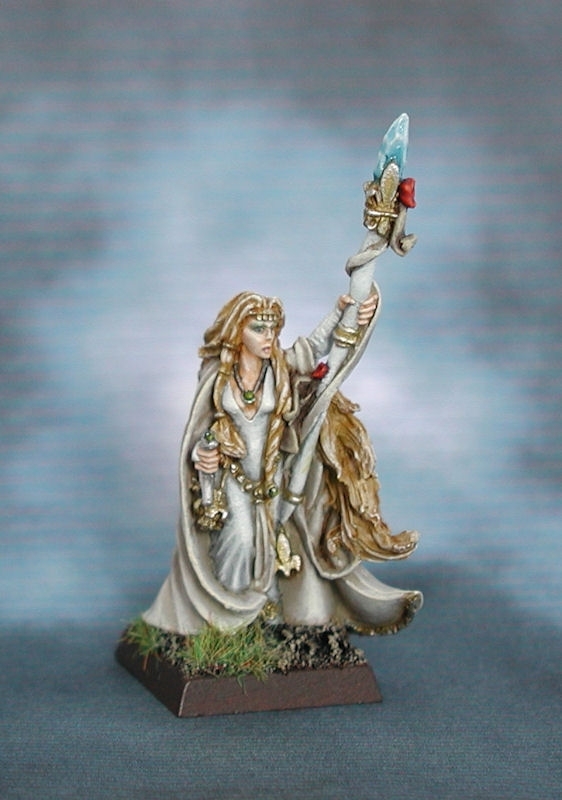 I styled it after a GW painting of a very ethereal version of the Knight, with very high contrast colours. 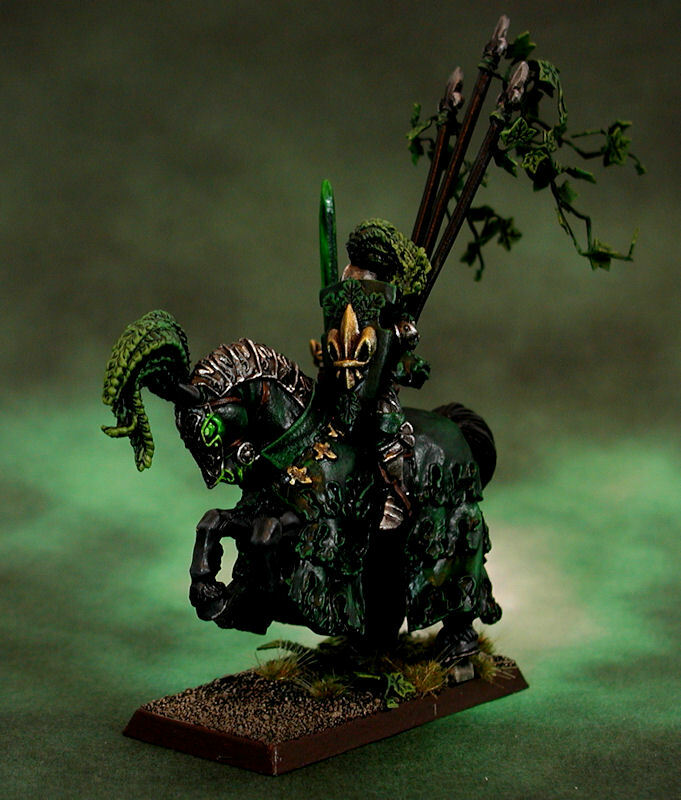 I wanted to reinforce the ghostlike aspects of the Green Knight with glowing eyes (and nostrils and mouth for his steed), and to achieve that the whole model had to stay pretty dark. I also wanted to reflect his unearthly link to nature, so I used brass-etched vines as a back banner, and painted the plumes to match. 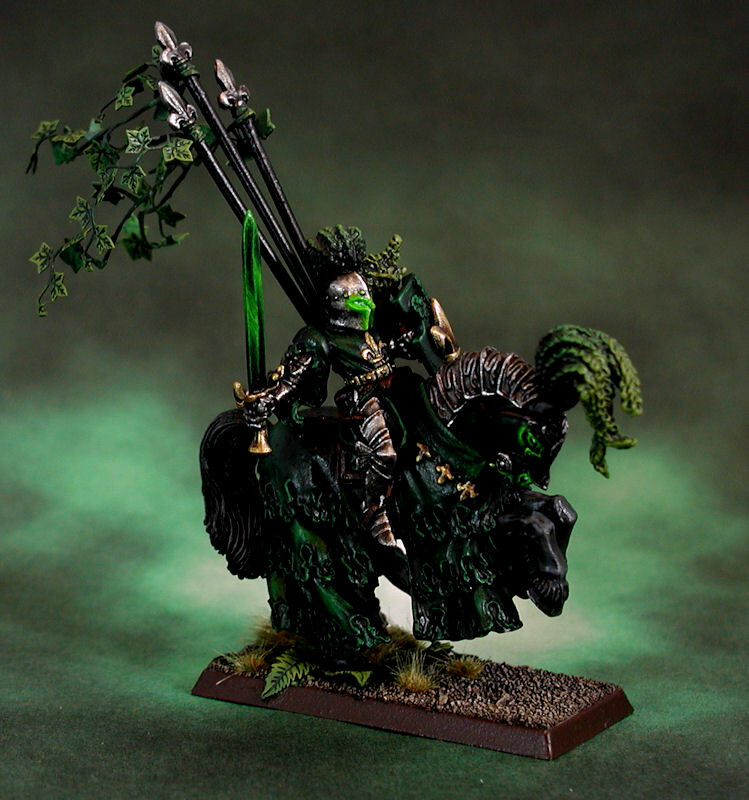 The base is meant to suggest verdant forest plants bursting up from beneath the hooves of his charger. Overall, I was quite pleased with how the glowing eyes came out. 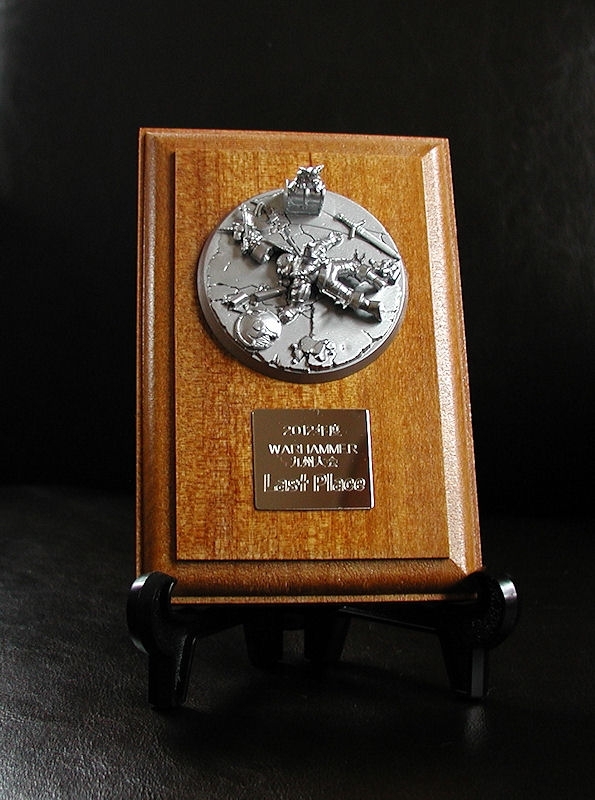 Abe-san's model was actually missing it's "Green Man" shield, so I made one out of shield bits and brass etched oak leaves - which seemed fitting. 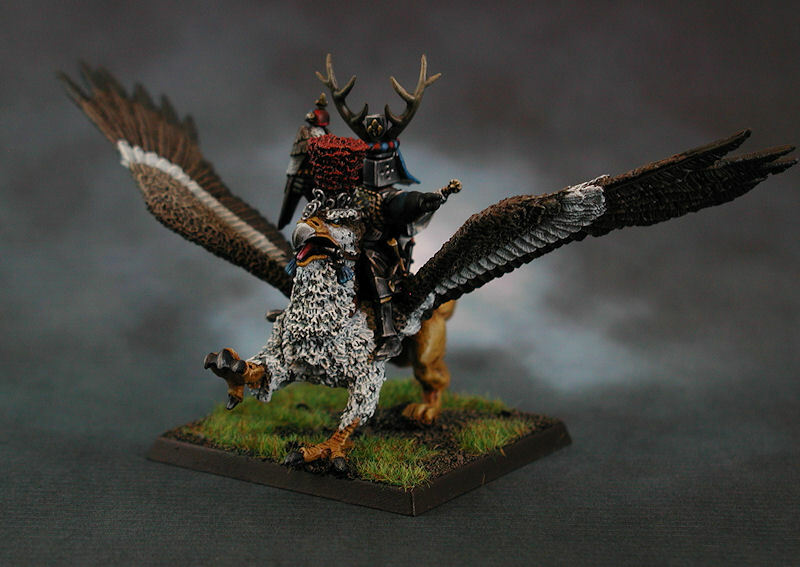 UPDATE: This lord on griffon is not actually army-list legal, as it should be a hippogriff (eagle/horse), but I had an old Marauder one lying around. The Lord riding it may look a little odd, but he's made up of about 10 different models all taken from the club bits box. I found high elf dragon rider legs, but inexplicably they had one foot missing! 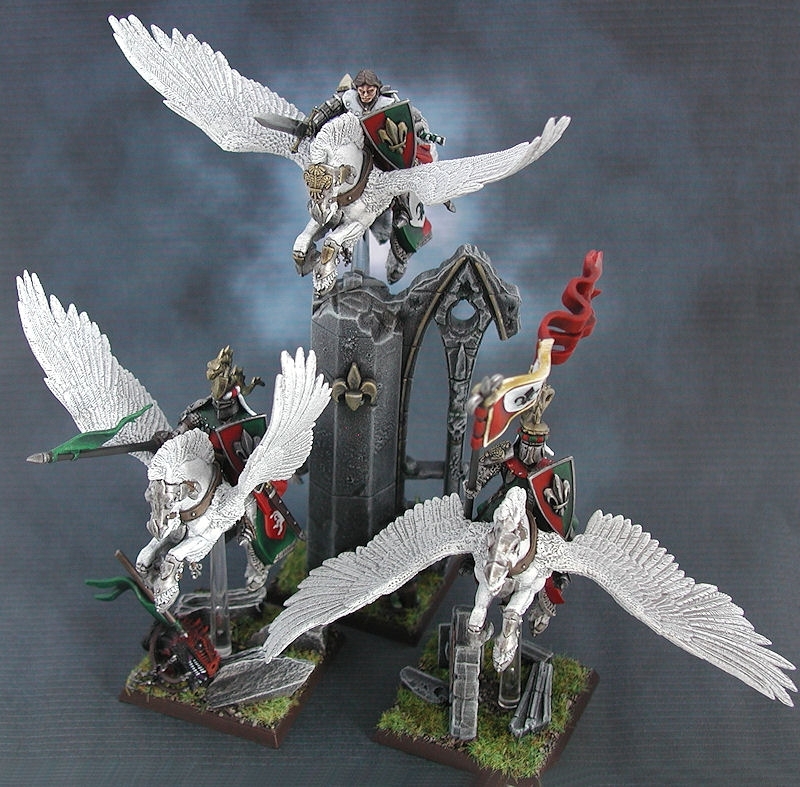 The head and hawk-arm are the only two bretonnian parts on the whole model. 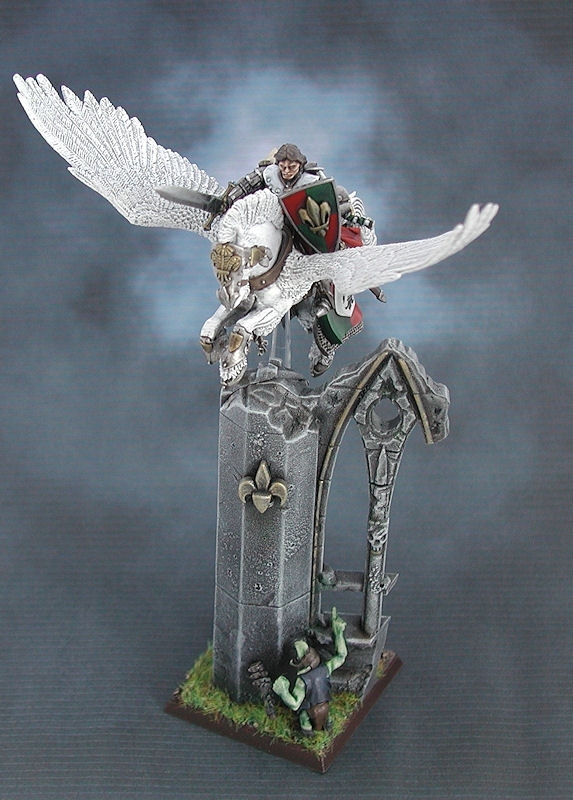 And don't even mention that daft head-plume on the griffon - how's a rider supposed to see where's he's going?! I tried something new for painting this model - non-metallic metals. 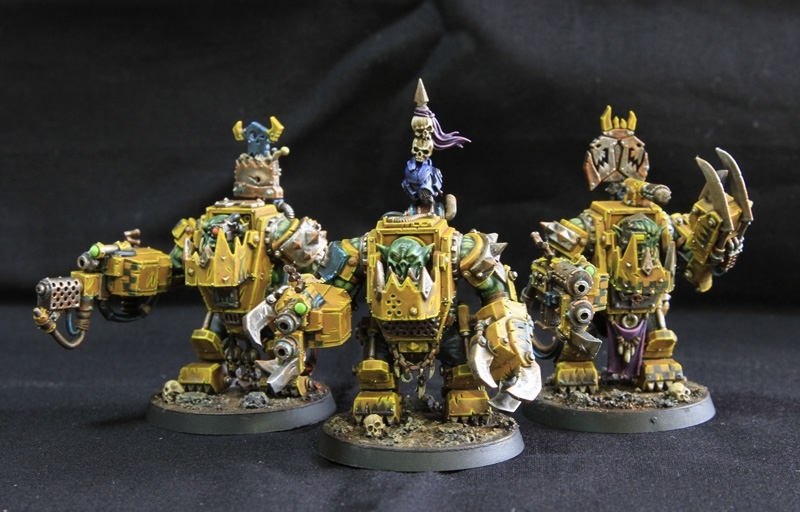 That means, instead of using boltgun metal and shining gold paints etc, I used blacks, browns, greys and whites. The overall effect came out quite well (I especially like the helmet), but it was very time-consuming. 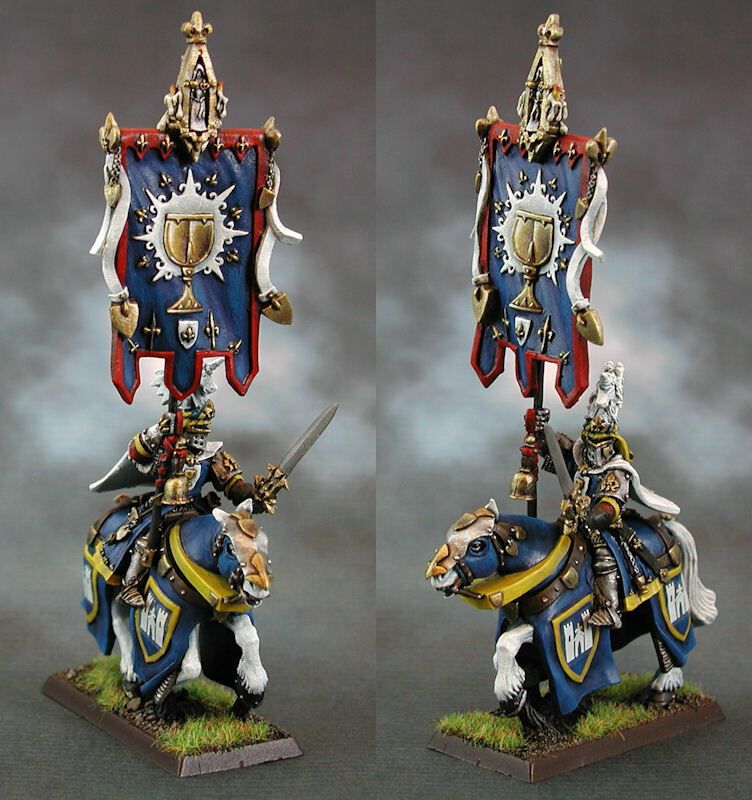 UPDATE: This is the army battle standard bearer, a very top-heavy metal model. I used blue and yellow instead of the army-wide green/white/red colours, just for some variation. I guess he's on loan from a neighbouring grail chapel? Taking a leaf out of Ross's book, I created some very themed bases for the pegasus knights. This one, the Duc le Mulvard, even has a gnoblar goblin busy looting the church below him, and dropping his club in fright! UPDATE: Well, Yukiko got her pink dress after all. She questioned the purple boots, though! I reckon it would be about right - floaty pink dress with deep pink velvet slippers and sleeves. Quite a nice figure to paint, although I'm more proud of the realistic colours of the horse! 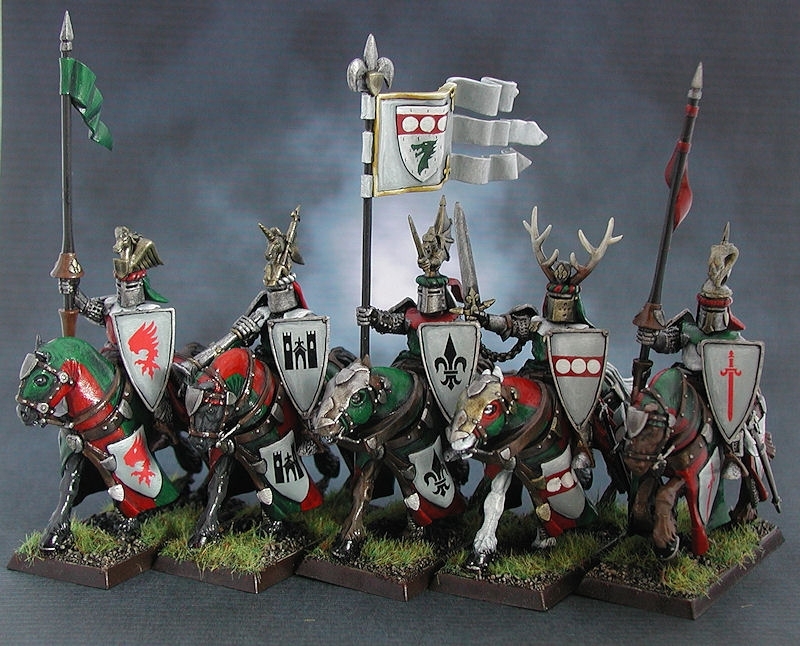 At least doing the knights in only 3 heraldry colours kept paint jobs quick and simple. Unlike the shield designs, which are transfers, the banner crest was drawn freehand. Check out the last photo below for comparison. 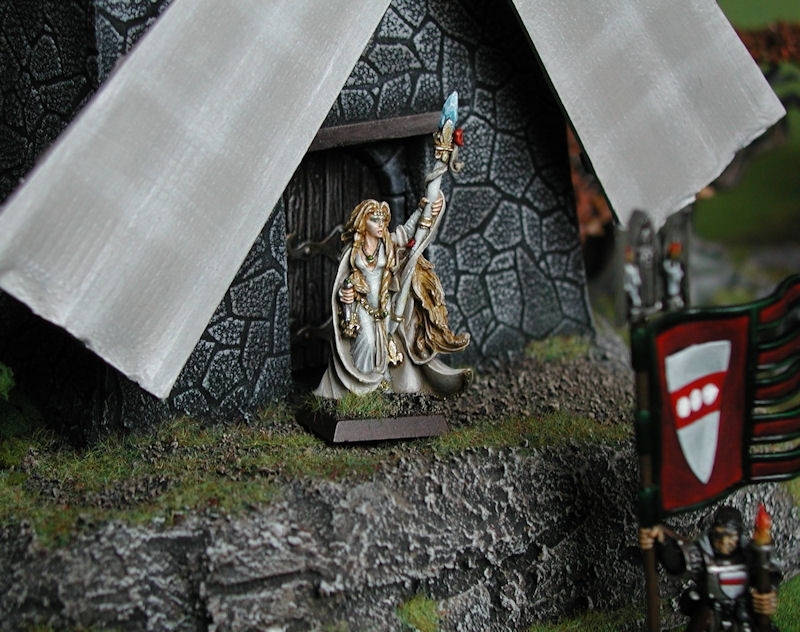 It was also my first attempt at very basic non-metallic metals, for the gold piping on the banner. 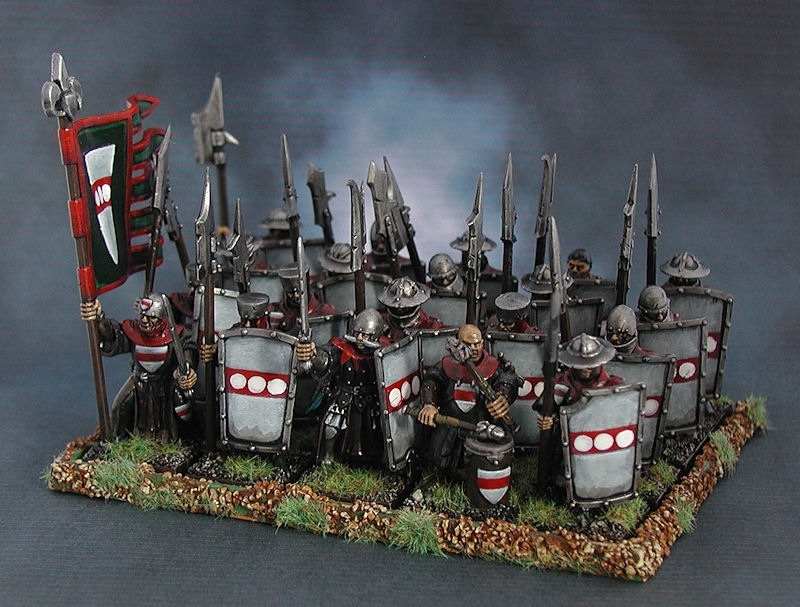 The men-at-arms have much more basic banner and shield designs, as befits the dirty peasants they are! Even the whites are grubby and grey. The lowest of the low, these only have grubby white coifs to mark their allegiance. These models were full of character and great fun to make, with every one having some type of poached animal pinned to their belts or hats. If you look closely at the bubbling soup pot, you might see their lunch being prepared - snail soup! I love plastic models - how else could you easily get 3 different poses out of the exact same kit, just by cutting and re-posing the wings?! The dead cold-one's head will tie this army into their struggle against their deadly rivals, the piratical raiders of the Dark Elves (once they are painted!). 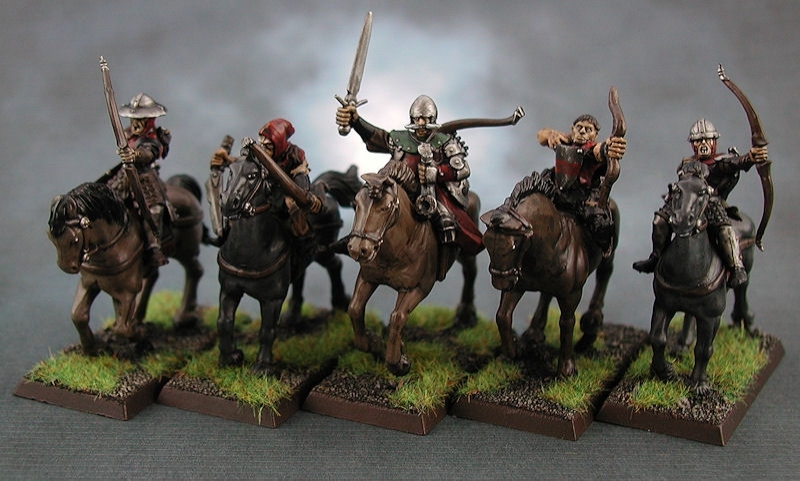 These mounted yeoman archers were added to the force after exemplary action as peasant archers, in a game Will played against Steve's daemons. Despite being slaughtered by charging Khorne Bloodletters, these plucky peasants rolled a double one for a break test, and held up the daemons long enough for a countercharge by their lords and masters. In gratitude for their efforts, the Duc gifted them with 5 tired old nags destined for the cookpot (of course charging them for the privilege). 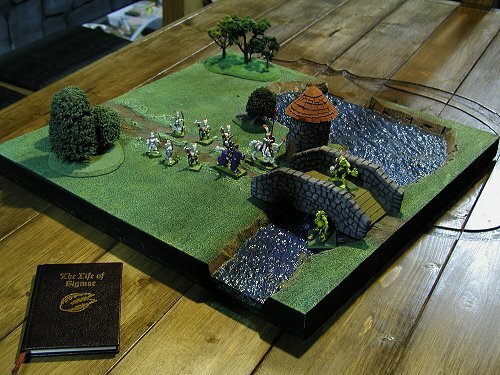 They are led by one-legged old Guilliaume, survivor of the original daemon attack and master of the yeomen. 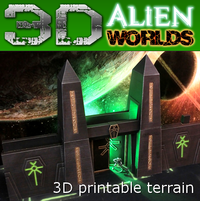 The models are taken from handfuls of bits from the club bits box, plus plenty of greenstuff. 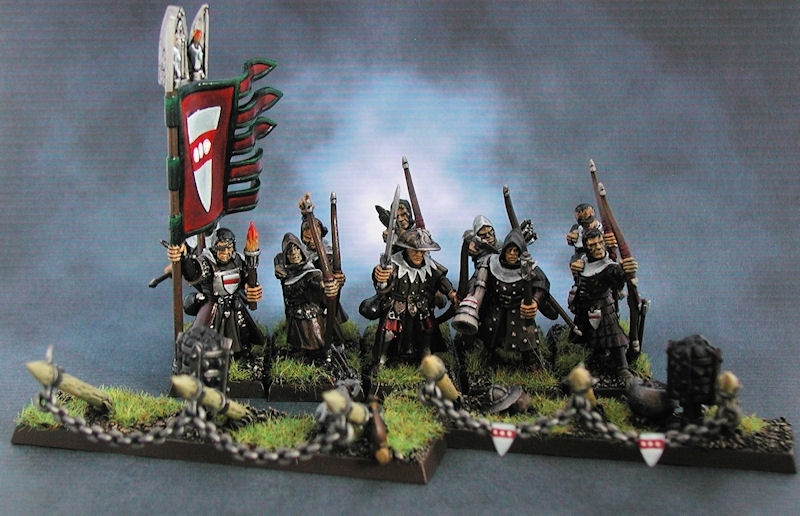 See if you can spot the parts from Bretonnian knights, peasants, wood elves, kislev, high elves, grenadier goblin and even a random "eagle knight"?! As always David, looks awesome, but I cant find Mash? It's a little out of focus, but Mash is sniffing round a soup pot by the archers' stake fence.